What’s so spooky about solar? Did you see any solar panels out and about this weekend? If you attended a Halloween party with any members of the current government then you probably did. The latest policy developments in the community energy sector give the impression that the government are more afraid of solar power than zombies, clowns or vampires. So it’s hardly surprising so many of them dressed up as a solar panel this weekend. It’s been an ‘interesting‘ few weeks in the community energy sector. It all kicked off with the devastating plans to more or less scrap the feed-in-tariff (one of the main income sources for community energy) at the start of next year, that have already led to thousands of job losses across the country. This came alongside the removal of the ability to pre-accredit community energy projects, which essentially meant that any projects that were hoping to operate under the tried and tested financial model (which has been delivering so much social, financial and environmental value of the last few years), needed to rush to get them registered by the end of last month. That was followed this week by the unexpected decision by the Treasury to remove the successful social investment tax relief scheme that was previously available to investors in community energy (which saw investors able to recoup 30% of any investment). There’s plenty of information all over the web now (and it’s great that national newspapers, etc. are now picking up on this) covering exactly what’s going on so I won’t go into any more detail on that here. The real surprise here comes as the sector is doing so well. 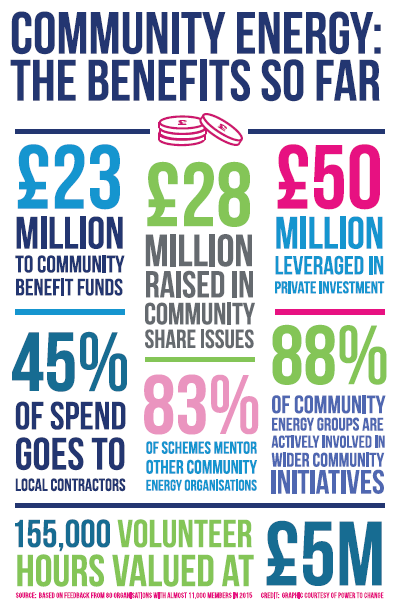 As mentioned above, community energy is a real rare blend as a sector, being able to so effectively create financial, social and environmental value in lockstep (that is – if one benefit goes up, the other two do so too). To demonstrate this, Community Energy England and Power To Change undertook some brilliant research into community energy where a bunch of community energy organisations (us included) fed back some facts on what we’ve done and what we plan to do, for them to be able to map out the current impact of community energy and the (huge) future potential. Two infographics (below) were produced and a further report. A nod as well to the lovely folk at 10:10 who also ran a wonderfully fun and creative campaign to #keepfits a week ago. We joined them for one of the days at Hampstead Heath to talk to people there about community energy and encourage them to let the government know why they should have a rethink. There are wider reasons to be optimistic – whether it’s Tanzania’s plans to light up a million homes with solar, Morocco’s exciting desert-based plans to become a solar superpower, or a floating solar farm in Manchester, innovative green projects are sprouting up all over the world with increasing regularity. But finally – what can you do? Sign up to receive updates from 10:10 on their keepfits initiative – there’s plenty more you can do to let the government know the value of community energy. Email your MP, for example. But the best thing you could do is to come join us at PUNL – we’d love to hear your ideas for projects, events, or anything! Just drop us an email – I promise we won’t scare you. 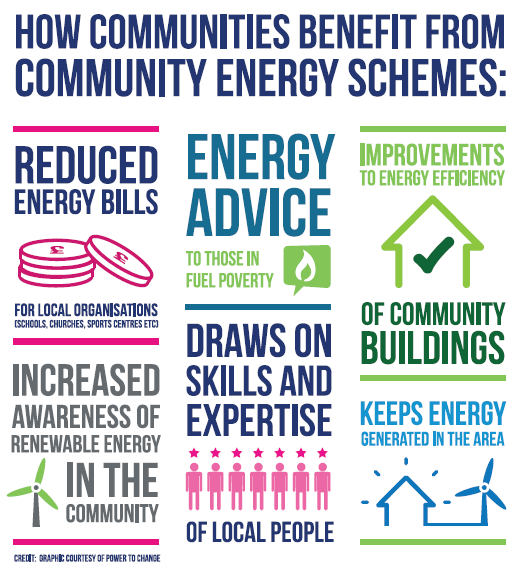 Community Energy London Event – reasons to be optimistic?